We started with the Farmer’s Market Salad, a mix of organic greens with local grown offerings and Vinaigrette dressing on the side. What were these “local grown offerings,” you ask? 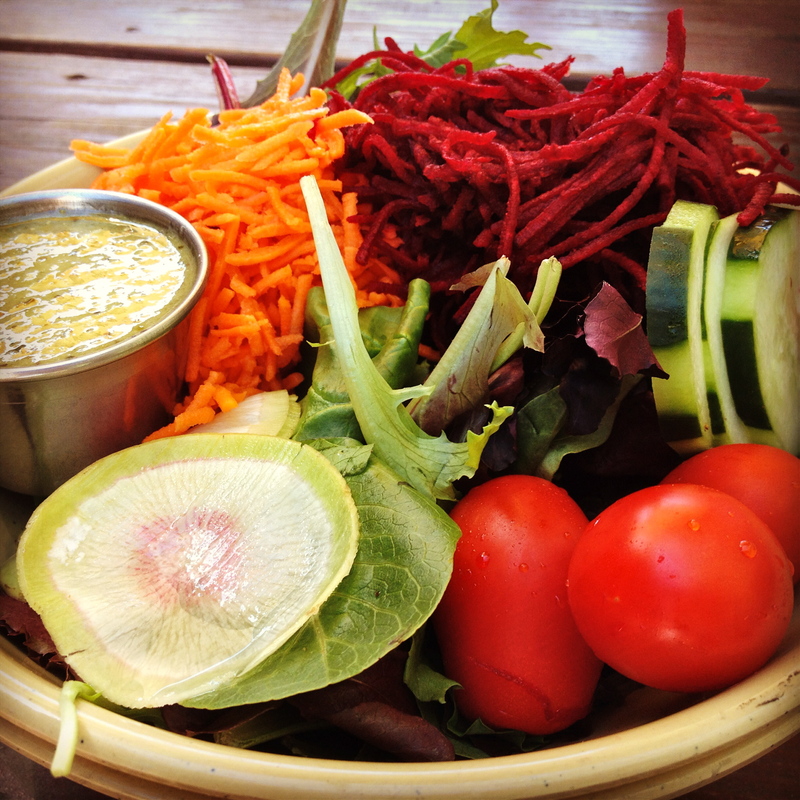 Fresh red beets, carrots, cucumbers, and a pile of red tomatoes covered my vibrantly colored mixed greens. A real salad! Station Tavern offers two vegan burgers. 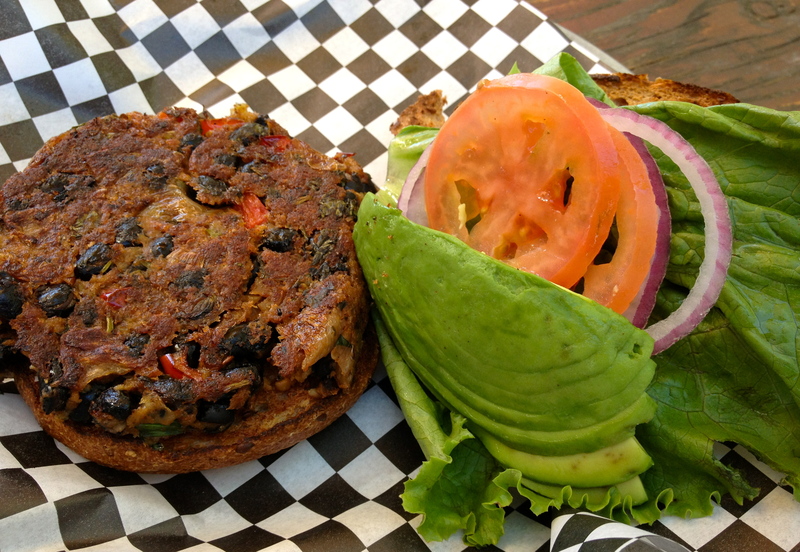 First up was the housemade Spicy Black Bean Burger, a veggie patty made from a blend of black beans, bell peppers, and spices. Note: The lime cilantro spread is NOT vegan. One fun solution is to sub in mustard for the spread! The black bean patty was thick and had a good consistency. And it did not crumble or fall apart! Although the name is a bit of a misnomer – as the burger is not particularly spicy – the patty is well seasoned and tasty. I particularly liked that I could see some actual black beans poking out of the patty! 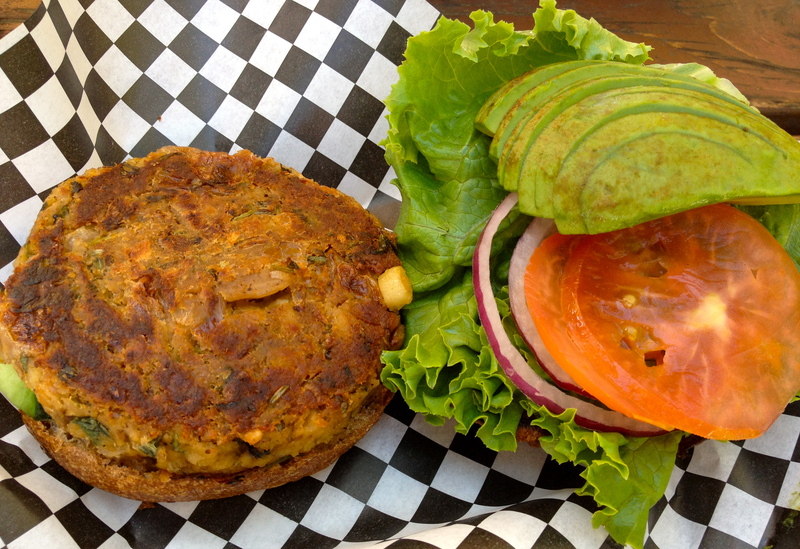 Next, we had the House Veggie Burger made from chickpeas and mild spices. Again, the smoky paprika sauce that comes with the burger is NOT vegan, so we again subbed in mustard. This chickpea burger is another satisfying success. 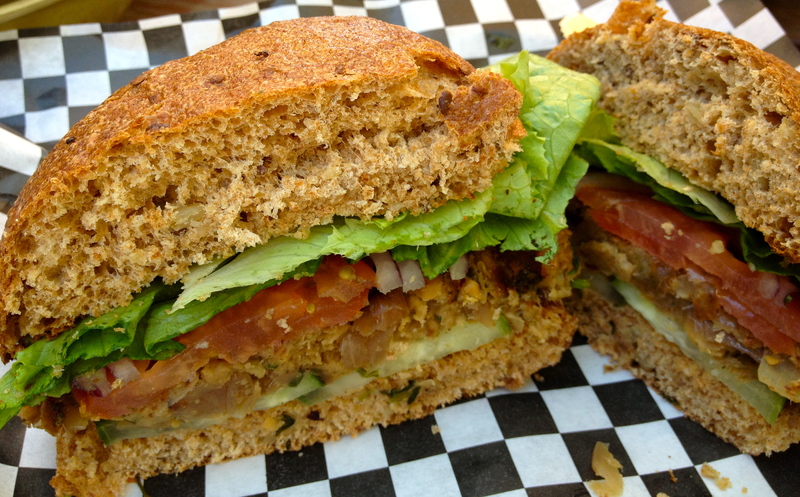 Station Tavern has clearly acquired the secret to cohesive vegan patties – not an easy feat. I also appreciate that it offers two vegan options. One option brings us in. But the second makes us feel welcome. Especially when both are well executed. Would a burger experience be complete without fries? 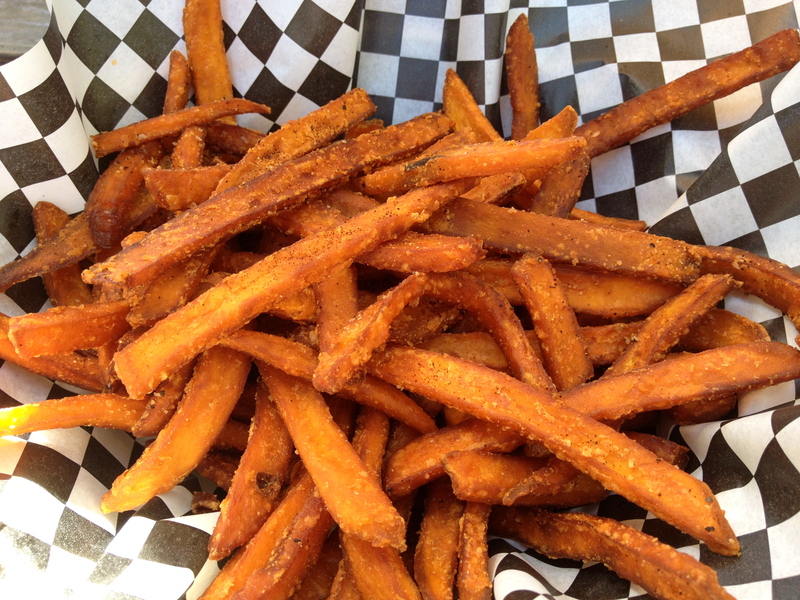 We decided to order a full order of sweet potato fries. It turns out that Station Tavern has my favorite type: medium sized with a crispy, salty exterior and soft, sweet inside. And the full order is substantial – best for sharing. Not a fan of sweet potatoes? No worries. 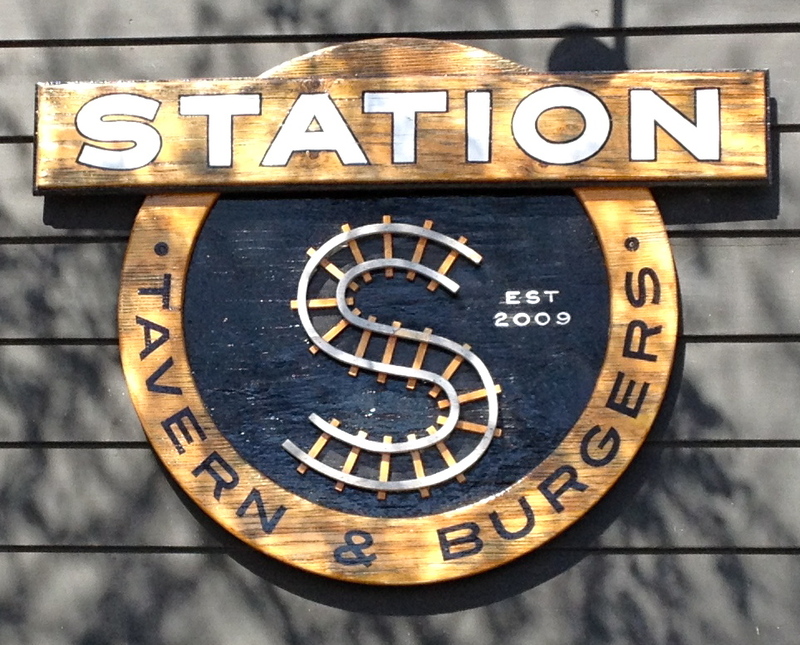 Station Tavern also offers regular fries, garlic fries, and tater tots! 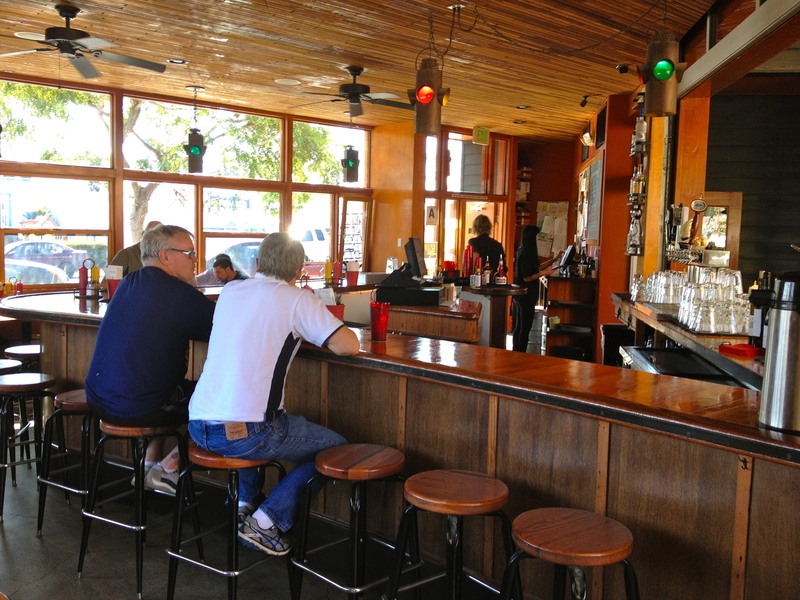 Station Tavern also has a casual, laid-back atmosphere. The inside seating boasts plenty of light with wood tables and chairs and a bar area. 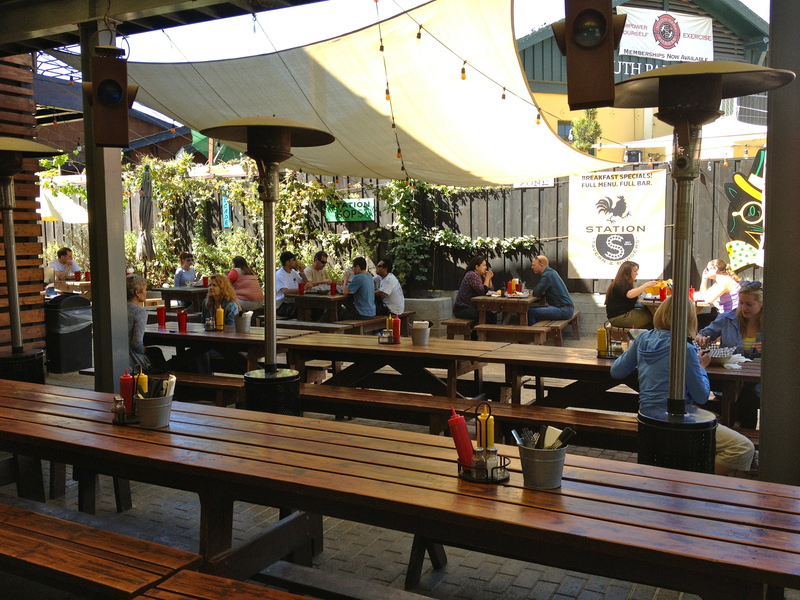 Station Tavern’s best feature, however, is its expansive outdoor seating. Picnic tables adorned with umbrellas (if it’s hot) and space heaters (if it’s not) create a cozy and inviting area for those looking to share a meal or drink with a significant other, a group of friends, or your dog! Station Tavern also offers a Tofu Pup – a tofu dog on a bun that is vegan. If you try it, let me know what you think!